The M-Series' Tier 4 line — the E42, E45, E50, and E55 — includes a non-diesel particulate filter engine and an ultra-low particulate combustion engine. 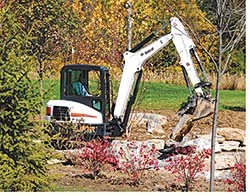 Each model features an independent boom swing for offset operation, as well as auto-shift travel. The 13 attachment options include augers, breakers, plate compactors, grading buckets, trenchers and rippers. The Hydraulic X-Change™ system uses hydraulic pins that retract and extend with the push of a button to change attachments.